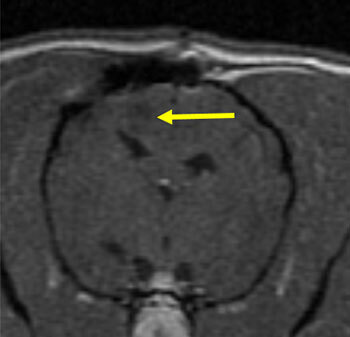 Post-operative MRI confirms complete remission and the white areas have been removed (yellow arrow). The PVM Canine Brain Tumor Research Program is a research program involving all aspects of canine brain tumor research: diagnosis using MRI, surgery, chemotherapy and other post-operative therapies. We also work closely with the Radiation Oncology service who provide radiation therapy including Stereotactic Radiosurgery. Directed by Dr. Timothy Bentley, a board-certified veterinary neurologist and neurosurgeon, we run clinical trials and other research designed to improve the diagnosis, management and understanding of canine brain cancer. Working closely with collaborators all across campus here at Purdue, and collaborators at the IU School of Medicine, we also work towards finding new therapies and surgical devices for human brain tumor patients. Canine brain tumor surgeries are commonly performed in conjunction with an MD neurosurgeon at the IU School of Medicine. 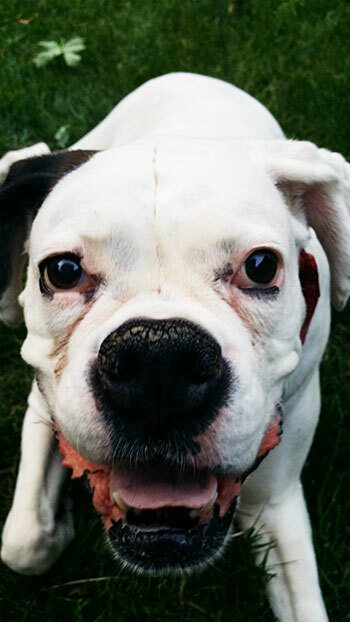 If eligible, dogs suspected of having a brain tumor undergo a brain MRI for reduced cost. Eligibility requirements include complete bloodwork and chest radiographs within the last month. Bentley RT, Thomovsky SA, Miller MA, Knapp DW, Cohen-Gadol AA. Canine (Pet Dog) Tumor Microsurgery and Intratumoral Concentration and Safety of Metronomic Chlorambucil for Spontaneous Glioma: A Phase I Clinical Trial.World Neurosurg. 2018 Aug;116:e534-e542. doi: 10.1016/j.wneu.2018.05.027. Epub 2018 Jun 5. Filley A, Henriquez M, Bhowmik T, Tewari BN, Rao X, Wan J, Miller MA, Liu Y, Bentley RT, Dey M.Immunologic and gene expression profiles of spontaneous canine oligodendrogliomas. J Neurooncol. 2018 May;137(3):469-479. doi: 10.1007/s11060-018-2753-4. Epub 2018 Jan 12. Bentley RT, Ahmed AU, Yanke AB, Cohen-Gadol AA, Dey M. Dogs are man's best friend: in sickness and in health. Neuro Oncol. 2017 Mar 1;19(3):312-322. LeBlanc AK, Mazcko C, Brown DE, Koehler JW, Miller AD, Miller CR, Bentley RT, et al (2016). Creation of an NCI comparative brain tumor consortium: informing the translation of new knowledge from canine to human brain tumor patients. Neuro Oncol 18:1209-18. Bentley RT, Burcham GN, Heng HG, et al (In press). 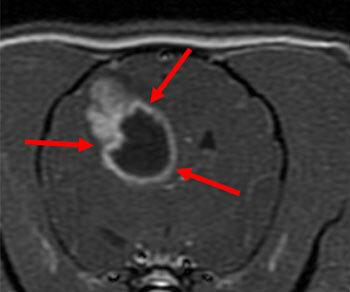 A comparison of clinical, magnetic resonance imaging and pathological findings in dogs with gliomatosis cerebri, focusing on cases with minimal magnetic resonance imaging changes. Vet Comp Oncol.